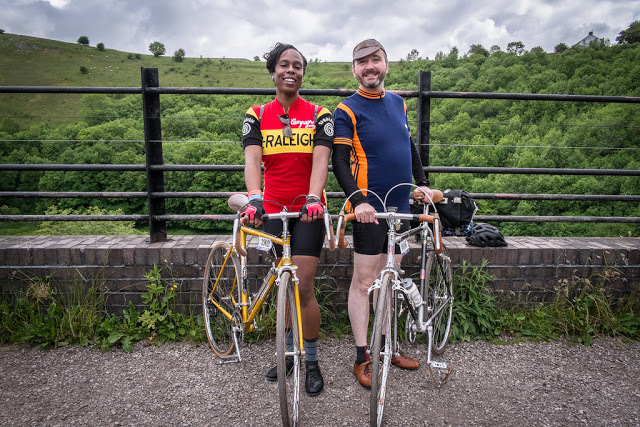 I’m a lover of all things vintage when it comes to cycling – as you’ll have seen when I’ve taken part in events like the Tweed Run and the Eroica sportives over the years. The old skool romance of it all – from the clothing to the bicycles and the history behind them has always appealed to both the cyclist and the cycle-style geek in me, so it’s always a joy to see subtle nostalgic nods to this in modern day bike riding. Someone else I know who has a love for vintage cycling is a wonderful chap called Tom Cartmale. 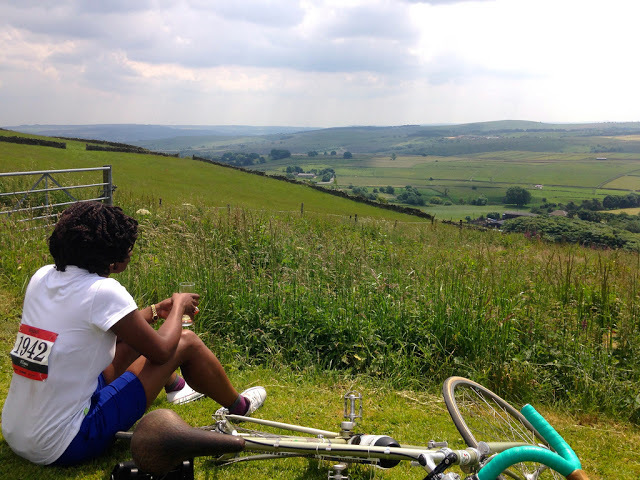 We met properly for the first time in 2013, back when I was working in my old cycling job. Tom came to my office for a coffee and a chat about a project he was working on that he figured I might be interested in. He brought in an old water bottle (often referred to as a bidon), and it was a beauty. This old style bottle which was usually front mounted on old steel-frame bikes, was a shiny alloy fluted thing, slightly heavy in weight, with a cork stopper. It felt durable and looked gorgeous, and that included the nicks and scratches on it. 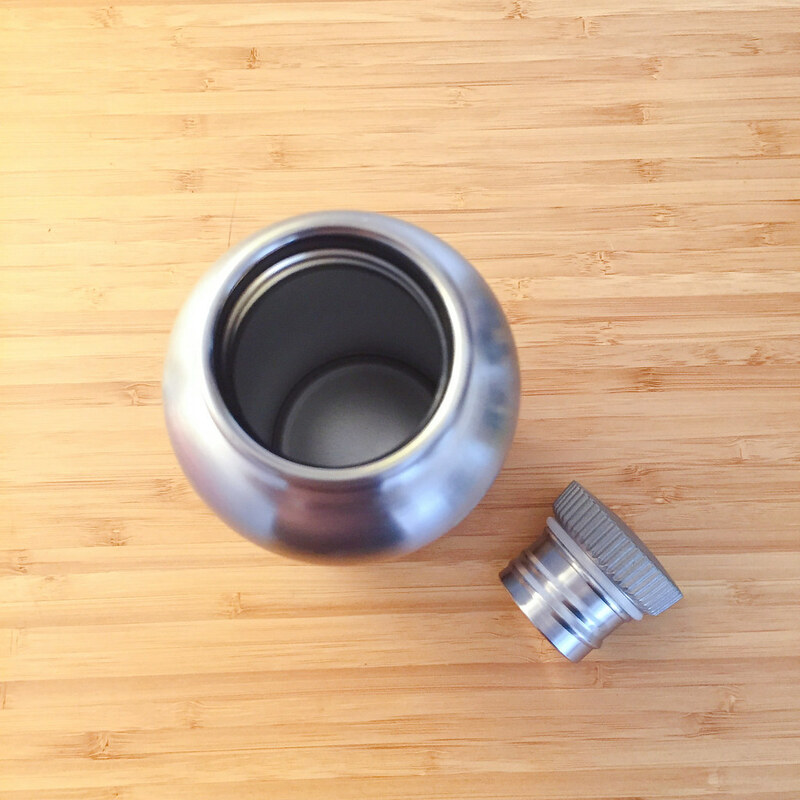 They made that bidon even more attractive as they told a story. He’d taken his love for cycling nostalgia to a whole new level with this silver vessel he placed on my desk. 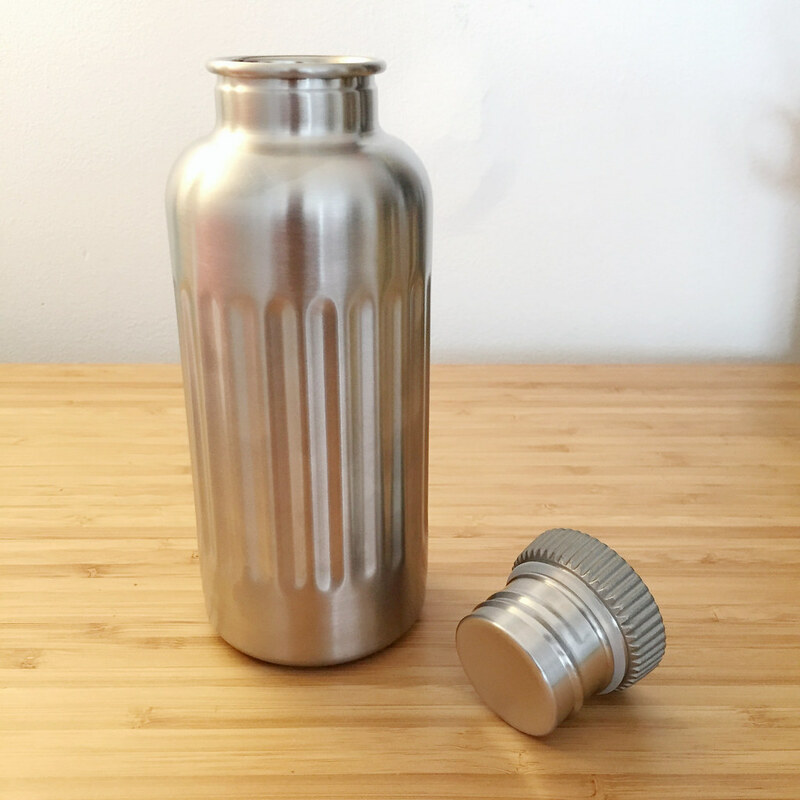 Tom’s obsession (which he discusses beautifully in this TED talk) that he developed with this humble cycling bottle turned into Kickstarter campaign to bring this particular one back. It was by Coloral: an iconic British brand originally based in Birmingham in the 1940s. Coloral used to make these traditional metal bidons with a stunning scripted logo inscribed on the bottom of them, which were used by riders not only to carry water, but also a blend of milk and sugar as an energy drink and even wine (something I witnessed people with metal bidons on L’Eroica in Tuscany doing). 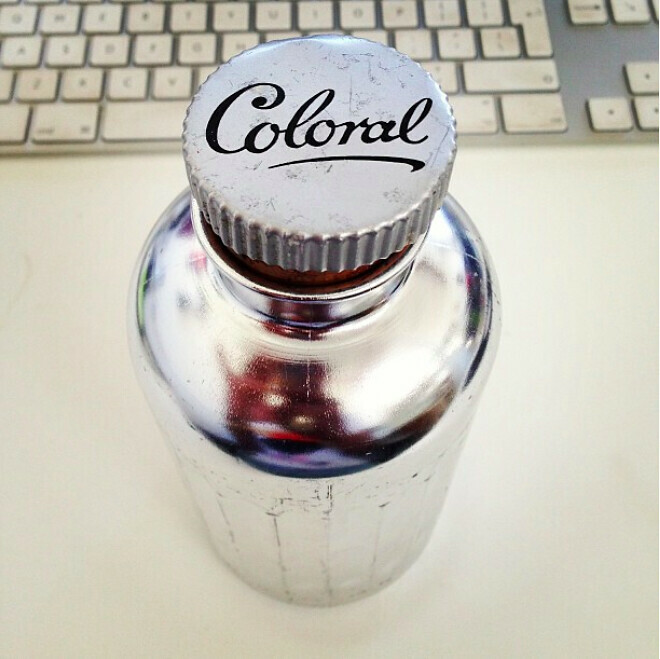 Coloral went out of production by the mid 1950’s due to manufacturing pressures and the rise in popularity of plastic cycling bottles. He wanted to bring this bidon back, but do more than simply make a replica of it. 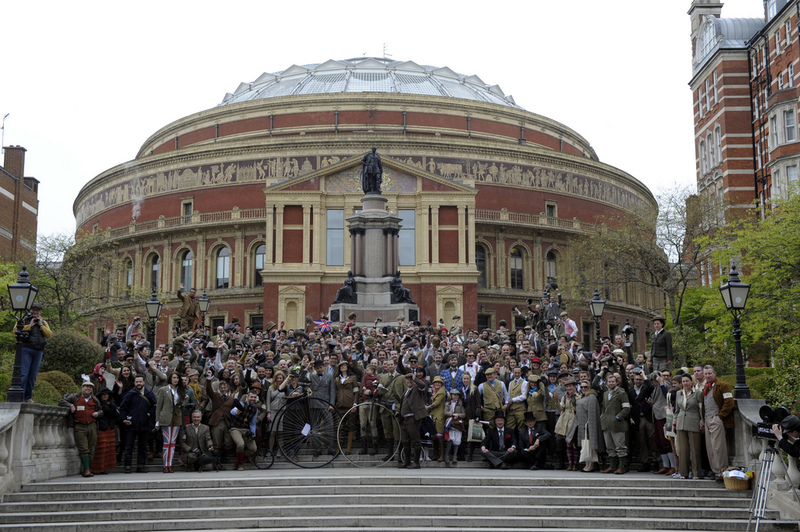 Tom and the team of people working with him were aiming to make it as faithful as possible to the original, but more functional and with a purpose too. Fast forward five years, and this summer saw Tom’s passion project finally come to fruition. The new Coloral bottle has been born – faithful to the design of its 1940’s predecessor and with a few modern twists. The 2018 version has been reengineered: the 14fl.oz bottle is now made out of food-grade stainless steel, with a brushed, muted finish. Its also ben vacuum insulated, meaning it will keep cold drinks cool and hot drinks piping hot – perfect for those balmy spring/summer rides or those more chilly jaunts in the winter months. 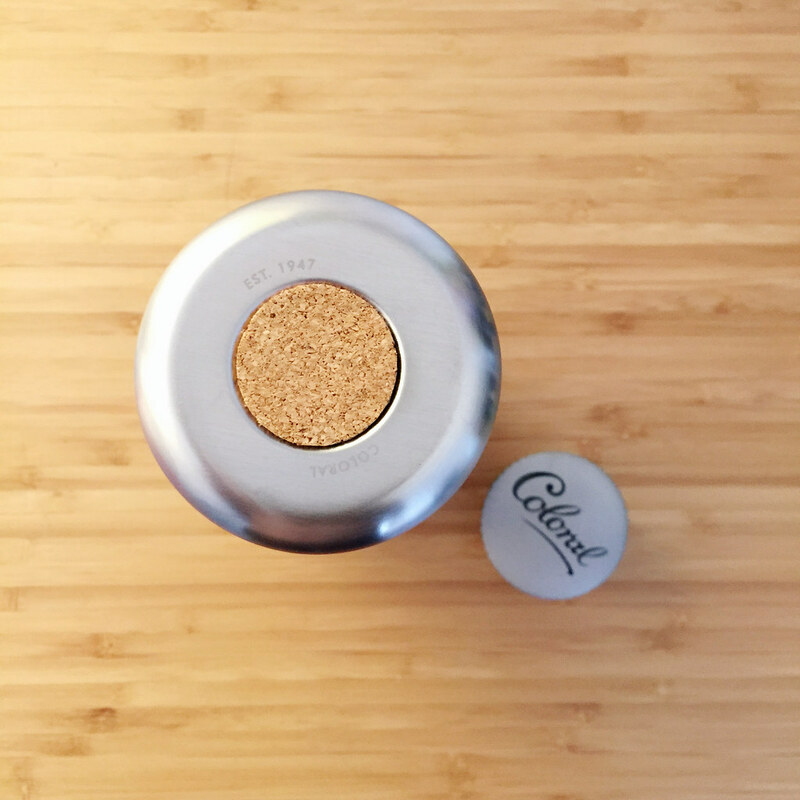 The old cork cap might be gone, but there is a nostalgic nod to it when you turn the bottle upside down. 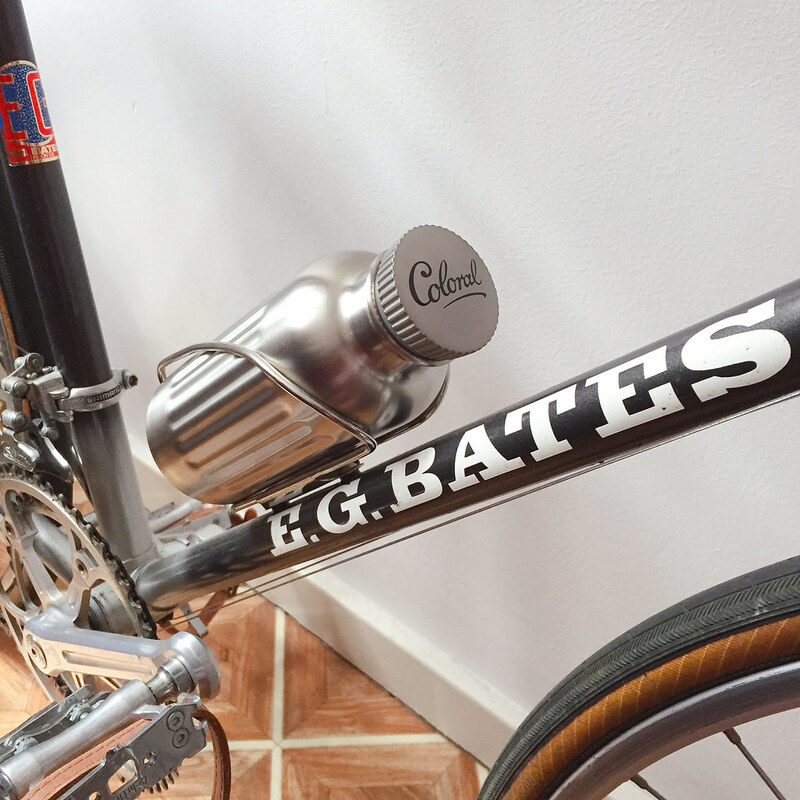 With some slight changes to the dimensions, Coloral bottles now fit most modern bottle cages, as illustrated on Ian’s 1982 E.G Bates… which on a side note, looks like a perfect match to the bottle. I already suspect Ian might be ‘borrowing’ this for retro rides on his bike. 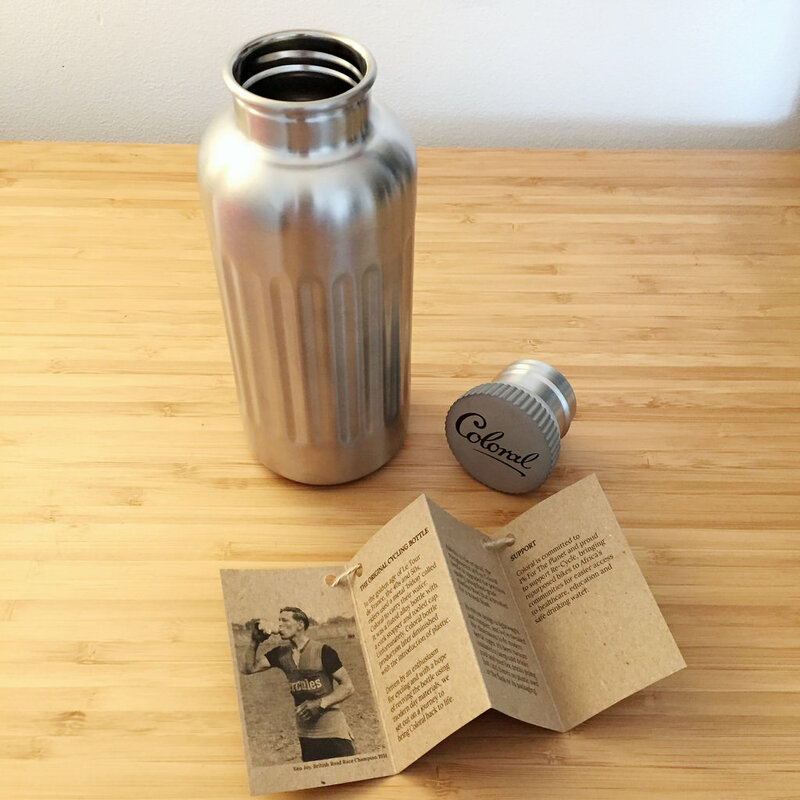 The new purpose behind Coloral is something that is awesome too: no plastic is used in the flask or the packaging it comes in. The brand is now committed to 1% For The Planet – working towards eradicating plastic pollution across the planet. 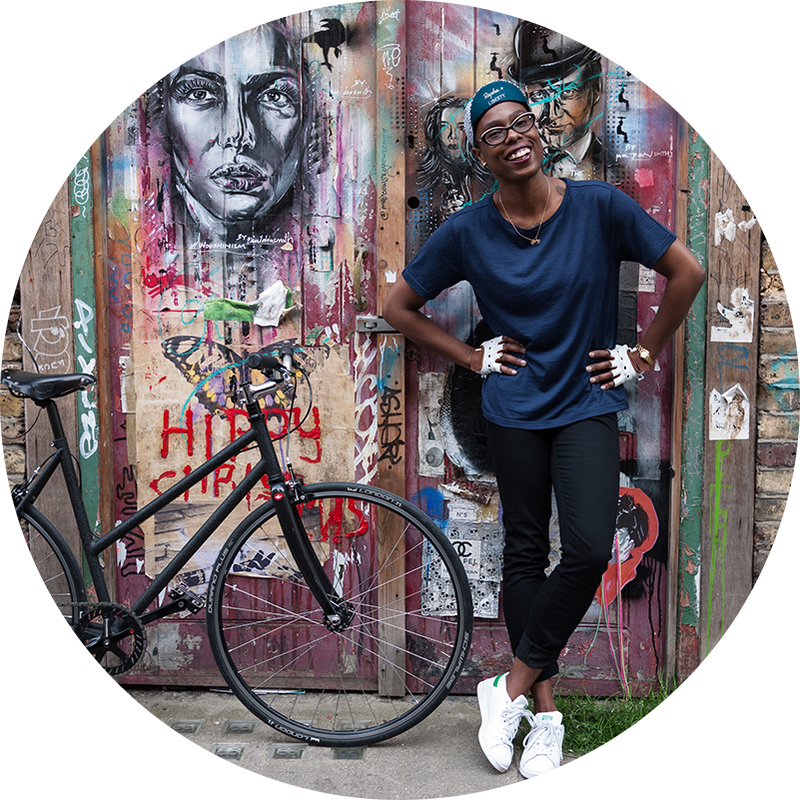 Coloral also supports the amazing Re-Cycle – a UK charity who are committed to improving life prospects through the provision of cheap and sustainable transport in Africa. 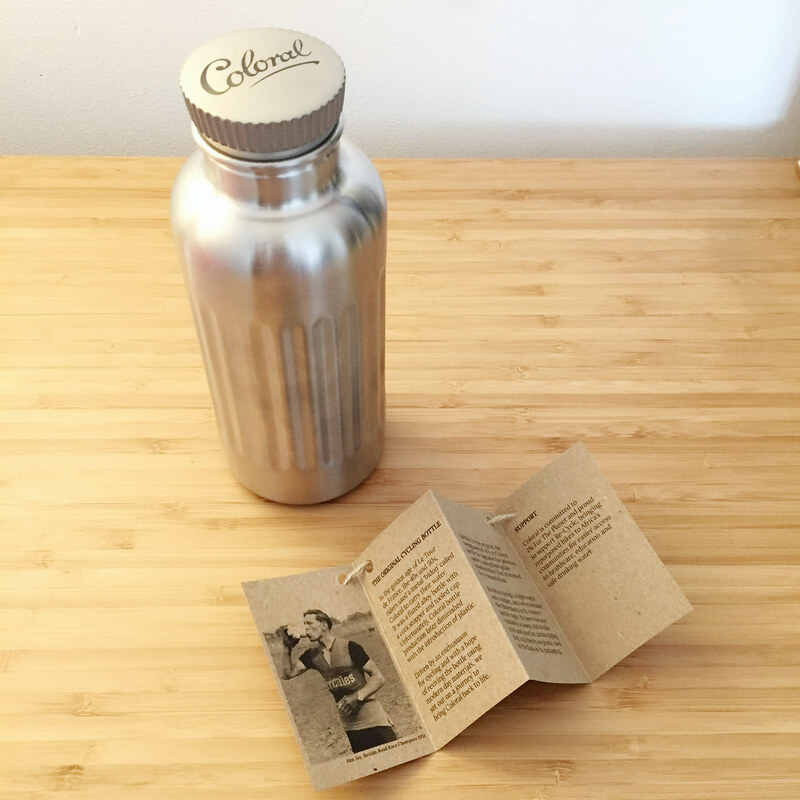 Every Coloral bottle sold helps support Re-Cycle, who repurpose 165 tonnes of discarded bikes each year, teaching communities how to repair and maintain their bikes, allowing them easier access to essential amenities such as healthcare, education and clean, safe drinking water. The fact this brings it full circle to Cororal’s purpose is absolutely brilliant. I’m so pleased that Tom came in to chat with me that day back in 2013 about Coloral. His drive, determination and passion for it to happen was amazing back then, and stuck with me about pursuing your dreams on a bike. Its been even more amazing to follow Tom and the Coloral team on this journey – especially as they were honest enough to include the initial Kickstarter and design highs and lows as mentioned in that TED talk. It took some big decisions to go their own way and lots of perseverance, and now it has all come to life. Now, seventy-one years after the brand was first launched, Coloral is back again, with a loyal acknowledgement to its glorious past, and a forward thinking approach to the future and working towards making it better with the causes it supports. Who knew a cycling bottle could hold so much more than water? Great read for my commute to work.